A central theme in therapy is that everyone has certain core issues like feeling inadequate or unloved that threaten psychological stability. Psychological defenses attempt to mitigate the negative effects of these core issues but sometimes these defenses are maladaptive (i.e. trying too hard to get noticed by others or getting into unhealthy romantic relations) and lead to psychosocial troubles for the individual. This paradigm is closely related to the Ego-Psychological psychodynamic model. Understanding and re-working these defenses and how they lead to trouble, as well as minimizing the effects of one's core issues is a very powerful tool in therapy. The model is clearly described to the patient, and the therapist and the patient work together to make a clear picture of how these factors fit together for the patient's individual situation. It is often helpful for patients to write their own "case description" in the third person in order to help with an objective understanding of oneself (see the case examples below). This understanding can then help one to develop more adaptive life strategies (defenses), thus leading to fewer troubles, as well as minimizing the negative influences that specific core issues may have over one's daily life. Core issues are mental schemas that one has about themselves and the world. They are often unconscious, coming to the surface only under specific psychosocial stress. Some examples of core issues are that of feeling: unloved, unwanted, unvalidated, inadequate, threatened, controlled, and belittled. While everyone has more or less of all of these issues to negotiate as a child, the intensity of these issues that remains as an adult differs from person to person, probably determined by a mixture of early life experiences and relationships as well as family genetics. Core issues that remain unresolved serve as major drivers in one's personality structure as an adult. Core issues threaten one's sense of psychological stability and one needs to have defense mechanisms against them. For descriptive purposes, defenses can be divided into adaptive (mature) defenses that lead to contentment and smooth psychosocial functioning, or maladaptive (immature) defenses that lead to psychosocial troubles. Adaptive defenses include things like logic, making jokes, praising and helping others, as well as sublimating one's feelings into work and play (ie. a person who has aggressive impulses and who becomes a boxing announcer is using a relatively adaptive defense against his aggression). Defenses are largely unconscious; one is not usually aware they are using a psychological defense in everyday behavior, although insight into one's defenses can be obtained in psychotherapy. Resistance is also an important feature of defenses as one does not want to easily give up the way they have become used to dealing with the world. 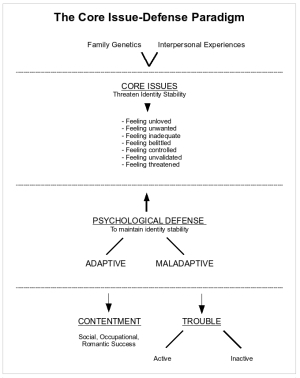 The more maladaptive the defenses one uses, the more likely one will have troubles in life that result from them. Maladaptive defenses include things like bragging, devaluing oneself and others, projecting one's feelings about oneself into others (i.e. misogynists and bigots project their own internal devaluation onto others), exploiting others, externalizing one's aggression (like getting into fights easily etc. ), avoidance, over control, passive-aggression, frantic attempts to avoid break-up of a relationship, and many others. You can see that the maladaptive defenses are more child-like, more unrefined, and can easily lead to trouble. When one's first-line defenses fail, one tends to resort to more and more maladaptive defenses, leading to more trouble, and sometimes to a catastrophic reaction (e.g. a suicide attempt to get a lover back after all other attempts have failed). Troubles can be divided into active or acute troubles that greatly bother the individual, and inactive or chronic troubles that the individual may or may not be aware of (see the case descriptions below for examples). The troubles are usually the complaints clients bring to the sessions, they do not often come to talk about their defenses or core issues. Early life experiences and family genetics leading to a particular set of Core Issues that threaten psychological stability. The Core Issues are protected by Defenses: Adaptive (leads to smooth psychosocial functioning) or Maladaptive (leads to psychosocial Troubles). Troubles can be divided into active or acute troubles, and inactive or chronic troubles.